Our 2019 CSA will begin the week of May 21. This will be our sixth year. In 2018, we had 48 members. For more information, email tobogganhillfarm@gmail.com or call 716-326-2060. What is a CSA? A CSA (Community Supported Agriculture) is a seasonal membership for a weekly supply of fresh produce. It offers a chance to support a local farm and, by extension, a local community, and at the same time get the farm’s freshest produce. As a CSA member, you are sharing in the risks, but also in the pleasures of being part of the farm. Why Toboggan Hill Farm? We use organic seed when available and we use good agricultural practices such as crop rotation, companion planting, and cover crops. We use no artificial fertilizers, herbicides, or pesticides. 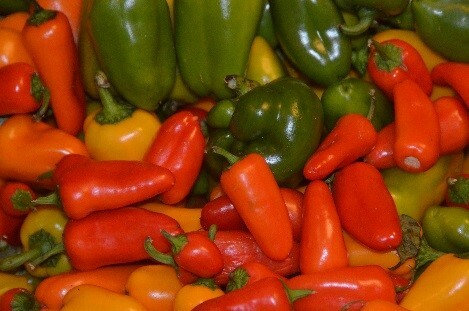 We will make every effort to supply you with a bountiful variety of tasty vegetables every week. Shares: The value of a share most weeks will exceed the price paid. The most abundant packages are usually in the middle to end of the growing season. We recommend full shares for three or more people, half shares for two, and quarter shares for one person or for two people who eat out often. Crops we plan to have over the summer: apples, asparagus, basil, beans, beets, broccoli, cabbage, carrots, chard, sweet corn, cucumbers, dill, eggplant, garlic, gourds, grapes, greens, kale, wild leeks (ramps), lettuce, melons, nasturtiums, onions, parsley, peas, pears, peppers, potatoes, pumpkins, radishes, spinach, squash, strawberries, sweet potatoes, tomatoes, and turnips. A favorite item is our salad mix with several kinds of lettuce plus other greens. Please be aware that growing crops is subject to conditions beyond our control and we don’t always have every crop we attempt to grow, but we guarantee that what what you receive will be the value you paid for if not more. Below is a week-by-week list of what we offered last year. Our farm (8380 Hardscrabble Road, Westfield), Mondays 5-6 p.m.
Bestor Fresh Market at Chautauqua Institution, Tuesdays, 9 a.m.-1 p.m.
Chautauqua Institution Turner parking lot, Tuesdays 4:30-5:30 p.m.
Westfield Farmers’ and Artisans’ Market, Saturdays 9 a.m.-2 p.m. Whole Foods Coop in Erie, PA, Fridays 12-7 p.m.
St. Luke’s Episcopal Church, 410 N. Main, Jamestown, Fridays 10 a.m.-8 p.m.
Audubon Community Nature Center, 1600 Riverside Road, Jamestown, Fridays 11 a.m.-4:30 p.m.
Substitutions can be arranged. We offer a choice of eggs, other vegetables, and all the pork, lamb, and goat meat products listed on our website. We will send an email two days before delivery and give substitution options. If we don’t hear from you, we will assume you want the standard share. Work share option: We are offering a limited number of work share options. For every week you work 2 hours, you would receive a half share for that week. If interested, call or email us. To sign up, send us your name, address, email address, phone number, pickup option (see below) and a check for the appropriate amount. Make checks payable to Toboggan Hill Farm. Send to Mike and Donna Eisenstat, 8380 Hardscrabble Road, Westfield, NY 14787. You may pay in full now or half now and half by July 1. Registering early helps us plan our garden. Therefore, we invite you to deduct 3% if your payment is postmarked or delivered by March 9 or 2% if postmarked or delivered by April 10. For delivery to your door in the Institution grounds Tuesdays beginning around 5:30 p.m., add $60 for the season or $7 per week. If you would like to join for part of the season, these are the weekly prices for a full share: 1-8 weeks, $24; 9 weeks, $23; 10-23 weeks, $22. Weekly prices for a half share are: 1-8 weeks, $13; 9 weeks, $12.50; 10-23 weeks, $12. Weekly prices for a quarter share are: 1-8 weeks, $7; 9 weeks, $6.75; 10-23 weeks, $6.50. Questions? Email us at tobogganhillfarm@gmail.com or call us at (716) 326-2060. Also, check out www.facebook.com/tobogganhillfarm. May 22 – salad mix (includes lettuce, chard, arugula, and other greens); herbs (includes basil, dill, and cress); asparagus; and eggs. May 29 – salad mix (includes lettuce, chard, arugula, and other greens); herbs (includes basil, dill, and cress); garlic greens; and eggs. June 5 – salad mix (includes lettuce, chard, arugula, kale, and other greens); herbs (includes basil, dill, nasturtiums. and cress); and pork chops. June 12 – salad mix (includes lettuce, chard, arugula, kale, and other greens); herbs (includes basil, dill, nasturtiums. and cress); garlic scapes; and eggs. June 19 – salad mix (includes lettuce, chard, arugula, kale, and other greens); herbs (includes basil, dill, nasturtiums, and cress); garlic scapes; and pork cutlets. 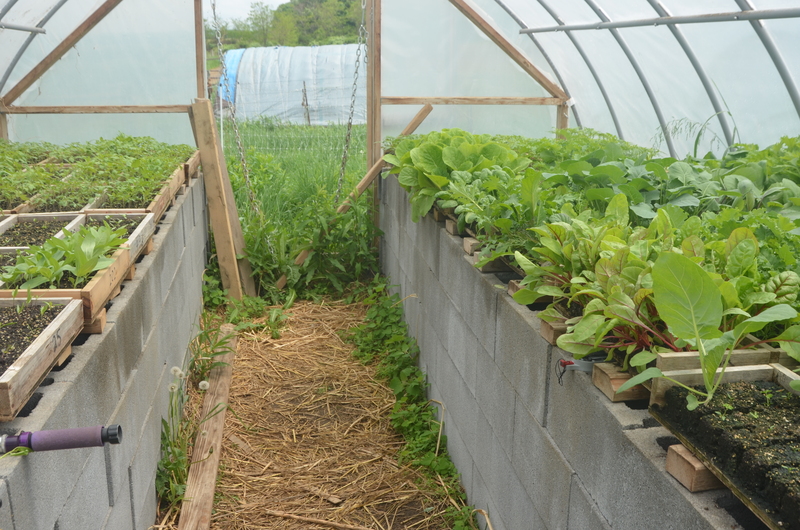 June 26 – salad mix (includes lettuce, chard, arugula, kale, and other greens); herbs (includes basil, dill, nasturtium. and cress); garlic scapes; snow peas; and eggs. July 3 – salad mix (includes lettuce, chard, arugula, kale, and other greens); herbs (includes basil, dill, nasturtium. and cress); garlic scapes; sugar snap (edible pod) peas; and eggs. July 10 – salad mix (includes lettuce, chard, arugula, kale, and other greens); herbs (includes basil, dill, nasturtium. and cress); garlic scapes; green beans; and eggs. Snow peas, shell peas, and sugar snaps also available. July 17 – salad mix (includes lettuce, chard, arugula, kale, and other greens); herbs(includes mostly basil and nasturtiums); radishes; green beans, a choice of sugar snap, snow, or shell peas; tomatoes; and eggs. July 24 – salad mix (includes lettuce, chard, arugula, kale, and other greens); herbs (includes mostly basil and nasturtiums); green beans; wax beans; sugar snap peas; tomatoes and cherry tomatoes; and eggs. July 31 – salad mix; green beans; wax beans; tomatoes and cherry tomatoes; potatoes; and eggs. August 7 – salad mix; green beans; tomatoes and cherry tomatoes; potatoes; garlic; and eggs. August 14 – salad mix; green beans; tomatoes and cherry tomatoes; potatoes; garlic; and eggs. August 21 – salad mix; tomatoes and cherry tomatoes; potatoes; garlic; sweet pepper; and eggs. August 28 – salad mix; tomatoes and cherry tomatoes; fingerling potatoes; garlic; sweet peppers; and eggs. Sept. 4 – salad mix; tomatoes and cherry tomatoes; potatoes; fingerling potatoes; sweet peppers; pears; and eggs. Sept. 11 – salad mix; tomatoes and cherry tomatoes; potatoes; fingerling potatoes; sweet peppers; pears; and eggs. Sept. 18 – pork chops; tomatoes and cherry tomatoes; potatoes; fingerling potatoes; sweet peppers; pears; Niagara grapes, and eggs. Oct. 9 – ground lamb; cherry tomatoes; potatoes; fingerling potatoes; radishes; Niagara and/or Concord grapes; and eggs. Oct. 16 – sweet potatoes; salad mix; smoked hocks; potatoes; Concord grapes; and eggs. Oct. 23 – sweet potatoes; salad mix; pork chops; potatoes; Concord grapes; and eggs. Oct. 30 – sweet potatoes; salad mix; cutlets; potatoes; Concord grapes; and eggs. What does a CSA weekly share cost and include?